 The Trivial Pursuit board game helps enhance general knowledge.  The family edition contains both easy and difficult questions.  Fun family game (for both adults and children). Trivial Pursuit is a fun trivia game that tests players' general knowledge. Having good general knowledge is quite important. Studies have shown that kids with a good general knowledge tend to better express themselves verbally and in writing and to get better grades at school. This board game was created in 1979 in Canada. After finding pieces of their Scrabble game missing, the creators decided to create their own game. It was finally released in 1982 and the game’s popularity peaked in 1984 in the US, a year in which 20 million games were sold. Today the game is sold in 26 countries and in 17 languages! The board game is available in numerous editions both for adults and children and editions even specializing in specific fields. The trivia game contains questions in geography, history, arts, literature, science and nature. The object of the game is to move around the board by correctly answering trivia questions. Questions are split into six categories and players use a die, playing pieces, question cards, and plastic wedges to fit into the playing pieces. The players that can answer the most questions win. There are many editions available and we recommend the Family Edition. The Family edition is designed for children ages 8 and up. The family edition contains both card questions that are right for younger players while the adult cards challenge older players on their own level. The great thing about this edition is that kids get the opportunity to answer more difficult questions. Adults can give kids hints in order to even things out. Kids can also enhance their knowledge by answering tougher questions. The Junior edition (ages 8 and up) available on Amazon is designed for children and contains questions in geography, history, arts, literature, science and nature specifically designed for children. 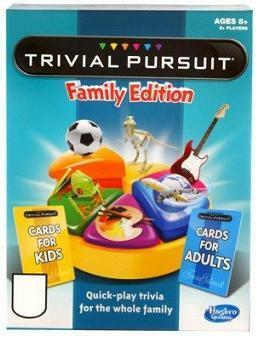 By the way, there is also the Trivial Pursuit for Kids edition which is also designed for school age kids. There is also a DVD version available on Amazon created just for kids. The interactive DVD contains 12 games. The fun trivia challenges which are just at the right level for younger learners. The game introduces children to a friendly new cast of characters that takes kids through a fun and challenging gameplay experience. By the way, you can also challenge your kid by playing the editions designed for grownups. For adults, we recommend the Master Edition and the 25th Anniversary Edition.